3D modeling tools is an umbrella term to describe software used for producing three-dimensional digital items of all sorts. You have a lot to choose from: desktop and online-based, CAD or “sculptors”, free or worth a small fortune, suitable for beginners or experts, single-feature or “Swiss army knives” and everything in between. But the most important question is whether browser apps can compete with classic software in terms of potential and workflow smoothness or not. Any 3D modeling company uses professional, industrial-grade programs. But cloud technologies evolve rapidly, increasing capabilities of browser applications. 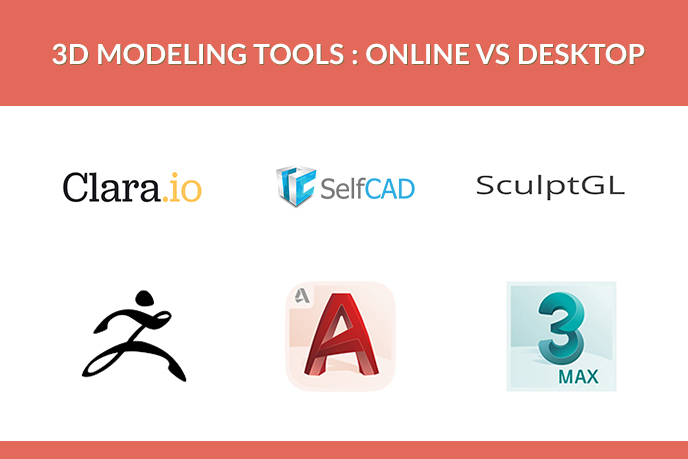 To understand what is better today, we will pit top 3 online against top 3 classic 3D modeling programs. Let’s start with browser software. SelfCAD is a neat package of simple to learn yet robust modeling toolset with intuitive GUI. This, coupled with the fact that it is browser-based and relatively cheap makes it a good starting choice for beginners. Problem is, that’s it – it is hardly useful for anything beyond education and 3D printing. Currently there is an alternative to traditional mesh creation approach – 3D sculpting. These programs innovate 3D modeling process – instead of combining objects, you sculpt them like clay. And among such tools, SculptGL is the only one that operates within browsers. The app has a very modest array of modes and brushes, but the point of this tool is to give a sense of how sculpting handles in general, and it does this job well. Clara.io is definitely the best among online 3D modeling tools. It offers an impressive range of functions – besides the common polygon modeling and texture maps, it includes Vray, keyframe animation creation, unlimited cloud storage and perfectly synced multi-user collaboration. And now, the heavy-hitters, top 3 commercial classic 3D modeling tools. Another CAD takes the bronze, this time it’s the progenitor of modern 3D modeling tools. Despite the age, AutoCAD is constantly updated. It is a very versatile program, used by a wide range of industries : architecture, engineering, graphic design and many others. AutoCAD is relatively easy to learn and can provide satisfying results for both beginners and professionals, who can tap into its true monstrous potential. Price: 720€ single user license. 400€ academic and educational license. This is the best 3D sculpting software out in the market, period. It incorporates all tools from other similar programs and adds several new ones. ZBrush allows progressive mesh detailing with dozens of brushes of all shapes and sizes. Other handy features are uniform polygon distribution and completely self-reliant intuitive basic geometry. The only critical flaw is steep learning curve, as it would take a lot of time to even get used to the array of functions. To be honest, any commercial Autodesk product would take the first place, but there can be only one, right? 3DS Max is another undying classic, particularly popular among game developers, vfx artists and 3D modeling studios. It is used not only to create renders, but also its unique engine provides a great array of effects. Particle, cloth and light simulation scripts (with a thriving creative community constantly adding new ones), mathematically precise parametric and organic mesh creation, spline-based modeling and much more. Mastering this software takes years, but in the end you’ll be capable of creating not just photorealistic 3D models, but living and breathing worlds! In the end, all types of software have their pros and cons. Browser programs are fast and easier to use, making them good for hobbyists and students. Industrial-grade commercial 3D modeling tools are bulky, difficult to learn and require some serious hardware to work properly, but beat even the best online counterparts with ease in terms of potential, features and versatility, allowing to produce spectacular three-dimensional prototypes. To effectively utilize both online simplicity and desktop power of 3D modeling tools, you should start working with outsource companies. All you need to do is send a task to a remote team of 3D modelers, and they’ll do it quickly using the best professional tools out there. Currently, this is the best option in the market. Want to give it a try? Sign up today for our 3D modeling services!